inXile Entertainment's Brian Fargo wants to update the classic dungeon crawler, popularized by MUDs and dark medieval adventures like Stonekeep and the Wizardry series, for the modern age, for the Halo or Gears of War player, with Hunted: The Demon's Forge. The argument can be made that the dungeon crawl has already been modernized with recent hits such as Gearbox Software's Borderlands or From Software's Demon's Souls, but inXile—founded by ex-Interplay folks—is taking a slightly different angle with its dark third person shooter. That approach is to stick closer than ever to the Gears of War design template, focusing heavily on cover, team-based range and melee combat and what Fargo calls "co-op at a distance." Hunted: The Demon's Forge is all cooperative action, all the time. Players will control one of two characters, the elfin E'lara, the minimally clothed bow expert, and the bulky Caddoc, good with a sword and shield. The two bounty hunters will work together, either as co-op players online or with one of them controlled by AI, throughout the story-driven campaign. Players can also swap between the two at checkpoints, for a little variety. In the demo we saw at GDC, inXile staffers played as both Caddoc and E'lara, strategically hunting down and flanking the various ghouls and hellspawn terrorizing the world of Kala Moor. While Caddoc would engage enemies at close range, shattering their wooden shields, slicing them with his massive blade and coating the screen with their black blood, E'lara would find high ground, picking off stragglers with bow and arrow. The two also worked together to solve puzzles that required one player to stand over there, holding down a pressure plate, the other dipping her arrows in flame and setting alight the eye of a rocky, sentient statue. E'lara and Caddoc could also cast offensive and defensive versions of their magical spells, lobbing fireballs at foes in once instance, setting the other player (in this case Caddoc) on fire to shield him with an invincible shell of flame. Hunted: The Demon's Forge's spell arsenal also features, at the very least, some levitation and lightning-based attacks, which players can upgrade by way of crystal through a Diablo-like skill tree. With a finite number of crystals scattered throughout the world of Kala Moor, players will have to be mindful of their upgrade path and how it complements their co-op partner's abilities. As far as the loot system, it appears it will be largely weapon-focused, with little more than shields in the way of upgradeable armor. Near the end of the demo, we got a peek at one of Hunted: The Demon's Forge's mini-bosses, a tall, spindly demon that required some cooperative thinking. The hunters attempted to hack and fire away at the monster to little effect, with Caddoc regularly shut down in his attempts to hack away at the beast. The solution involved setting Caddoc alight and invulnerable once again, hacking away, then entering a quick-time event of sorts, wrestling the demon's head within sight of E'lara who fired an arrow directly into its head. inXile and Bethesda promise plenty of dark fantasy cooperative action, challenging puzzles, "vast open vistas" and an "elaborate matchmaking system" in its Hunted: The Demon's Forge's two-player game, which is still undated. 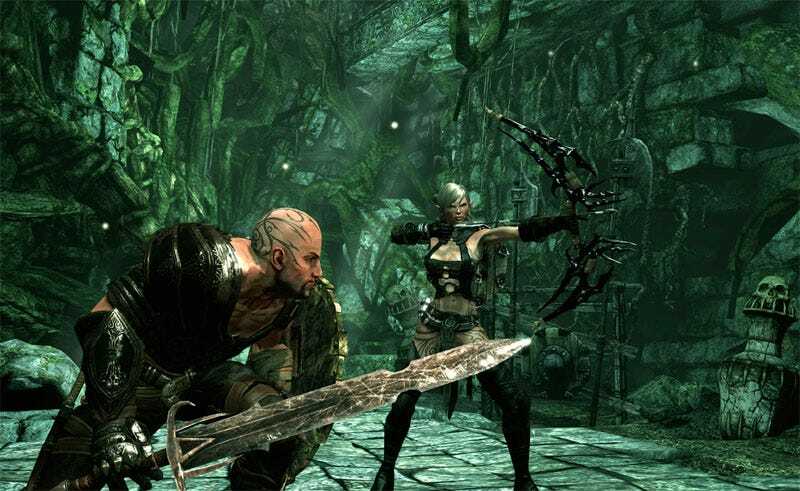 Hunted: The Demon's Forge is planned for release on PlayStation 3, Xbox 360 and Games For Windows PCs. From our perspective, Hunted: The Demon's Forge looks promising, but we're not quite yet sold on the concept. There are plenty of potential pitfalls in a game that demands that the player always be buddied up—will the AI be up to it?—and that it inspires comparisons to Tecmo's Quantum Theory right now. Hunted: The Demon's Forge is clearly early, but it could be a great two-player experience, at least a better, more gothic Too Human. Since we only saw with our eyes, not with our hands, it's too early to judge anything more than how it looks and be curious about its potential. Here are a handful of screen shots of Hunted: The Demon's Forge in action.